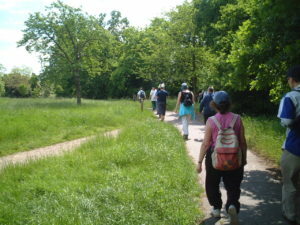 “Lewisham Health Walks are led by trained volunteer walk leaders. The walks are 30-60 minutes long. We end with a cup of tea where possible. Health walking is really easy. You do a 5-minute stroll to warm up, at least 20 minutes at a brisk pace and a 5-minute stroll to cool down. A ‘brisk pace’ will be different for everybody. Walk so you feel a little warmer, breathe a bit heavier and your heart is pumping a bit faster. you need to be able to have a chat and not be too out of breath. 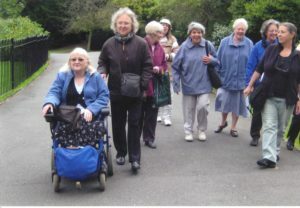 Go at a pace that is right for you – the walks are suitable for people of all abilities. Come when you are able to. Walk leaders will be at the meeting place before the start of the walk. If this is your first walk please click here to fill out the registration form on the Walking for Health website (you will be asked to create a new account). The walk leader will have registration forms to fill out on the day if you prefer to do it then. One leader will walk near the front of the group with the faster people. Another walk leader will be at the back with people who need to walk more slowly. You can walk at a pace that suits you. Expect to meet new people, make friends and enjoy yourself! Wear clothing that is loose and suitable for the weather – layers are best. Wear comfortable, well-fitting shoes or trainers. For most people, the walks are beneficial and should not cause any problem. However, we ask everyone starting the Lewisham Health Walks Scheme to fill out a registration form. This helps identify the few people kind need to have medical advice before starting this kind of physical activity (for example, if you have heart trouble, chest pain, dizziness or other pain made worse by activity). You can just turn up at the start of the walk but for the walks with varied routes, we recommend you contact us before your first walk. Please book for walks where indicated. Tuesdays at 10.30am Coming soon! Want to get more involved with Lewisham Health Walks? Join our team of volunteer walk leaders. 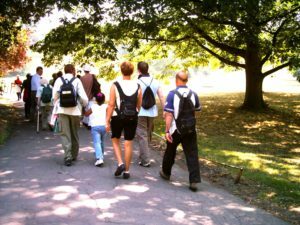 This FREE Walking for Health training is for volunteers, health champions and anyone interested in leading community walks.You will learn how to plan and lead safe and enjoyable health walks in Lewisham. Then, you will be able to join our team of volunteers and help with one of our ‘Walking for Health’ groups or set up a walk for your own community organisation. Being a walk leader is great fun: you will meet new people and get fit at the same time! The next course is being held in February 2018. Please contact us to find out more and to book your place. Your Parks – click an image for slideshow, escape to come back to page. An afternoon of live acoustic folk music in a beautiful secluded woodland. To coincide with Telegraph Hill Festival we will be celeberating spring at New Cross Gate Cutting Nature Reserve with four local unamplified folk acts. Beckenham Place park will be hosting the flower show in June this year. You can find the categories here.